Continue on to see the announcement trailer and official press release from 2K Sports. In addition to the exclusive James themed content and items, fans who purchase the NBA 2K19 20th Anniversary Edition will receive the game four days early, beginning on September 7. •	Custom Wristband featuring LeBron’s chosen words. 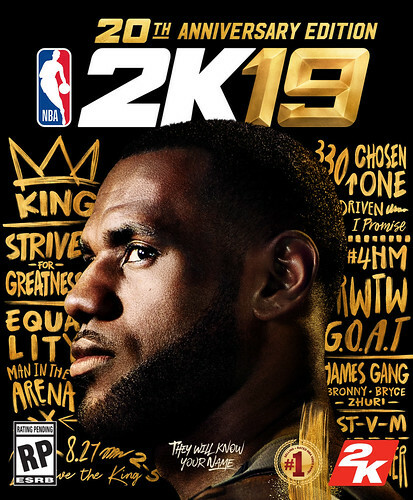 The NBA 2K19 20th Anniversary Edition marks the second cover appearance for the 14-time NBA All-Star. James, currently playing in his 15th NBA season, is also the co-founder of production company SpringHill Entertainment and digital sports media platform UNINTERRUPTED. Developed by Visual Concepts, the NBA 2K19 20th Anniversary Edition will be available September 7, 2018 for $99.99 on Xbox One, PlayStation®4 computer entertainment system, Nintendo Switch, and Windows PC. The NBA 2K19 Standard Edition will be available on September 11, 2018 for $59.99 on Xbox One, PlayStation®4 system, Nintendo Switch, and Windows PC platforms. It has also been revealed that J.R. Smith has pre-ordered it and will forget to pick it up upon release.